Phone manufacturers have to keep coming up with new innovations to prove their mettle against each other and 2017 has been a year of improvements in phone design. Asus is trying to up the game by bringing in Virtual & Augmented Reality into their phones in partnership with Google Tango, they’re not the first ones to do so let’s find out how good they are at AR? The Asus Zenfone AR does not come with the Google Daydream VR headset in the box which is disappointing since that’s what the phone is all about, but you can buy yours @ CeX! The phone stands out in terms of looks due to its burnished leather back and Gunmetal aluminium frame, feeling solid in the hand. At the back is the ‘TriCam’ setup - as Asus calls it, with triple LED flash & laser autofocus, all protected by a Sapphire glass to prevent damage. The 5.7” Super AMOLED screen comes with Gorilla Glass 4 and the QHD screen has a crisp resolution of 515 ppi, much needed when you want quality VR! You have the type C charging port and 3.5mm jack at the bottom, power and volume buttons on the right while the Hybrid Dual SIM slot is on the left. At the bottom of the screen is the Home button/fingerprint sensor. At the top of the screen, you’ll find the 8MP front camera, notification LED and Proximity sensor. The screen’s viewing angles are good thanks to the resolution but in daylight/outdoors you might find some reflections which can’t be avoided unless you turn up the brightness. The Zenfone VR is powered by Snapdragon 821 (which is so 2016) but paired with 8GB of RAM it gets the job done.The phone also has 128GB of built-in memory that can be expanded to 2TB with a microSD card if you want to download and watch VR to your heart’s content. Software wise the Zenfone AR has Android 7.0 with ZenUI 3.5 on top which has become lighter and faster over the years, looking a lot more like stock Android thankfully! Some fancy UI tricks available include double tapping to wake, gestures to launch apps, one-handed mode, ZenCircle for all your social networking. You can obviously customise icons, themes from the settings menu. Coming to the USP of the phone, the AR & VR capabilities which have been seen earlier in Lenovo Phab 2 Pro but never took off. 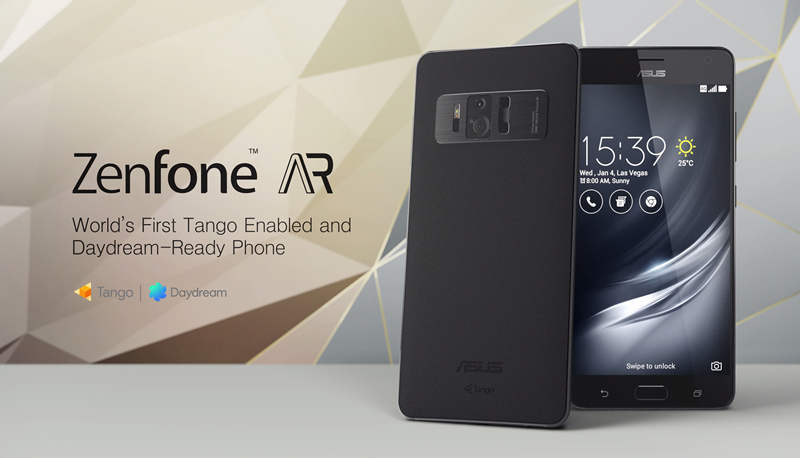 The Zenfone takes it up many notches with built-in apps like BMW i-Visualiser that projects the i8 or i3 cars in your living space (looks better with the Daydream headset) and lets you peep in, change colors etc. Then you have AR pets where you can have a pet dog/cat to listen to your commands or respond to your touch. The Measure app lets you measure the distance between actual objects. You can also try out Youtube VR and other apps and games in the Play Store that support VR.The phone might heat up a bit though if you’re on VR for more than 20 mins and the battery drain is noticeable. The rear camera is a 23MP shooter that supports autofocus and takes great pictures in daylight. You won’t say they’re as good as the Pixel, S8 or iPhone 7 Plus, but it will beat all other camera phones for sure. For some reason, the other 2 cameras are not actively involved in image capture so all your portrait shots and wide angle shots might not give the best effect like the dual setups of Honor 9 or OnePlus 5. Camera modes include Raw, HDR Pro, Low Light & Super-Resolution at 92 MP (although it doesn’t look 92 when you see the images ;) ). The front 8MP camera captures pretty neat beautified selfies as well. 4K video recording is up to 60fps. Obviously, with the 8GB RAM, you can be rest assured of stutter-free gaming (Asphalt 8, Modern Warfare, FIFA 17...) and multimedia, though the battery @ 3300mAh might come in the way of a full day usage. The bundled earphones are decent but won’t satisfy an audiophile. The battery does last almost 15 hours with heavy usage and will be enough for an average day without heavy gaming & AR. Overall, at the price point, the phone isn’t where it should be. Close to the Pixel XL and Samsung S8 pricing, you’d expect better features or a lower price. An extra point for trying to change the game, I’d give the Zenfone AR a 4/5. If you love AR or are testing/building VR apps this is the phone for you.